In 1991, as My Bloody Valentine* and Talk Talk were causing pop lovers to scratch their heads and exercise their all-too-recently passive opinions, Slint crawled out from under a rock in Louisville, KY and infected the emergent Post-Rock sub-genre with an unprecedented darkness. 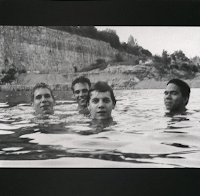 Spiderland has been dubbed one of the greatest albums in rock music, and Tweez, the band's disturbing first full-length, will always be under-understood and underappreciated. Like a pleasant dream that soon unfolds into a nightmare, Spiderland chimes to life. "Breadcrumb Trail", oddly enough, harnesses a spaghetti-western style, in that you can almost imagine Brian McMahan in the middle of some Andalusian dual, hand on his Colt and fresh wad of tobacco under his lower lip. I say "almost" because it's hard to imagine this while he's babbling on about some childhood memory of the midway of some dingy carnival, and the fortune teller he befriended. The perfectly-delivered harmonics as the track opens serves as a sort of melodramatic fanfare, announcing, ironically, the arrival of unimportance and paranoia. It only gets darker from here, friends. The sludge manages to become the grittiest thing you can imagine coming from a stringed instrument, and McMahan mimics this tone in his crackling vocal rants, creating a tapestry of unfocused, muddled grey and brown, and every other dirty hue you can think of (I'm visualizing those tacky 10x15 rugs that some old bearded veteran displays draped over the side of his 1970-something fatigue-colored VW bus along every urban drag in America). As "Nosferatu Man" creeps to life, our narrator's pensive whisper assures us he has something to hide behind the elusive picture he paints of phantom trains, kings and queens, and medieval castles. What's more unsettling - the subject itself or the fact that our narrator tells it so nonchalantly? Before we can ponder these mysteries, everything evaporates into "Don, Aman"'s hushed tale of social escape and awkwardness, and we have a whole new set of problems as we begin to seriously wonder what Don is about to do to himself. Pajo's grimy guitar blasts through our thoughts and escalates the urgency of what began as an introspective dive, and then it's done. "Washer" is arguably the prettiest song on the album, and "For Dinner..." trails it's delicacy nicely, with a charming depth all it's own. The album comes to completion with it's brooding final track, "Good Morning Captain", which is truly heart-wrenching around the 6 - 7 minute-mark, as McMahan infamously mourns, "I miss you". Don't you wish you had a friend nearby right about now? You can go on arguing the true birth-album of the entire Post-Rock genre till the cows come home in leather jackets, but I'll contest that, although Spiderland might not be officially the first Post-Rock release on record, this album has major clout in the sub-genre. One thing's for sure: You may never need a bottle of Zoloft and a good long cry like this again. *I apologize. An MBV reference these days is like overstating your personal wealth at a high school reunion. Please forgive me.